Synapse has adapted and updated the U.S. Environmental Protection Agency’s energy efficiency savings tool, which is attached as an appendix to the Clean Power Plan Final Rule Technical Documents (EPA, 2015. Data File: Demand-Side Energy Efficiency Appendix – Illustrative 3% Scenario (XLSX)). Consistent with the final rule, Synapse added the ability to distinguish between energy efficiency applied to different sectors—specifically residential, commercial and industrial, and low income. This model allows users to specify an energy efficiency ramp rate, savings level target, measure life distribution, and first-year cost of saved energy for each state. Importantly, the Energy Efficiency Savings Tool ability to account for measure life and distribution enables us to more accurately translate a percent savings target into the actual energy savings that can be expected from reaching that goal. 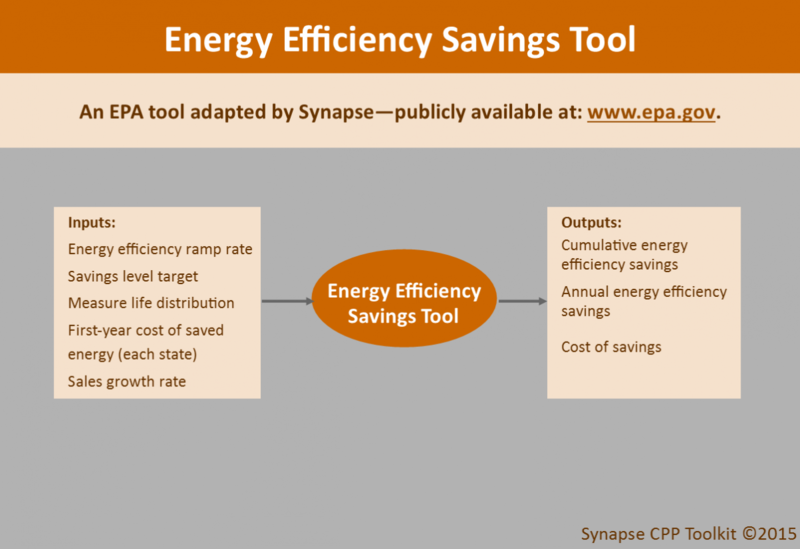 Energy Efficiency Savings Tool outputs—cumulative savings from energy efficiency and costs of achieving such savings—are used as inputs in the adapted ReEDS, CP3T, and RePRT models. The Energy Efficiency Savings Tool is available at: http://www2.epa.gov/cleanpowerplan/clean-power-plan-final-rule-technical-documents.